The Department of the Interior, through the Bureau of Reclamation, submitted a notice to the Federal Register today seeking recommendations from the governors of the seven Colorado River Basin states for protective actions Interior should take amid ongoing severe and prolonged drought. 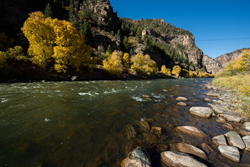 The Colorado River near Glenwood Springs, Colorado. Completion of drought contingency plans is long overdue. Action is needed now. In the absence of consensus plans from the Basin states, the federal government must take action to protect the river and all who depend on it — farmers and cities across seven states.